Former Sri Lankan president Mahinda Rajapakse speaks at a rally in Gampaha on August 14. Mahinda Rajapaksa is on the campaign trail. In the run-up to a crucial parliamentary election (overnight Fiji time), he is doing what he does best: making speeches, holding children, talking to the elderly and, inevitably these days, grinning for selfies. In Kantale, a small town in the eastern Trincomalee district, about 6,000 people have turned out to see the veteran politician. “He is the leader that brought dignity to this country … we could hold our heads high because of him. He took on terrorism and was the first leader ever to defeat terrorism,” said Chandrasiri Gamalath, a 47-year-old paddy farmer who had traveled 40km to see Rajapaksa in action. The stakes are high for Rajapaksa, who was ousted as president after calling a snap election in January with the aim of winning a third term. If he, and his numerous relatives, cannot gather genuine mass support in this poll, his comeback bid will have failed. “There is unfinished business from January. Does the country want the Rajapaksas back in some shape or form?” asked Paikiasothy Saravanamuttu, a well-known local analyst. The most recent surveys indicated only moderate support for the 69-year-old candidate. “There doesn’t appear to be a big groundswell,” Savanaramuttu said. Rajapaksa came to power in 2005, led his country’s military to a bloody victory over violent Tamil separatists four years later and surfed a wave of popularity among the Sinhala majority to win again in 2010. He then had the constitution changed to allow the third term he hoped to win in January. However, allegations of corruption, violent intimidation of political opponents, attacks on journalists, growing resentment among Tamils and mounting sectarian violence led to concern at home and abroad. The benefits of economic growth did not reach many poorer, rural communities, a key support base. The appointment of three brothers, a nephew and a son to key posts prompted charges of nepotism. The constitutional changes led to accusations of authoritarianism. Even so, few observers predicted victory for Maithripala Sirisena, who was minister of health, when he announced he would stand against the incumbent president. And few believed the Rajapaksa clan would go quietly if defeated. But Sirisena won by six per cent and the transfer of power occurred without problems. The current campaign took place against a background of multiple divisions in the island nation of 22m. Not only is there a rift between the Sinhala majority and ethnic or religious minorities but there is personal animosity between president Sirisena and his predecessor – the split within the once dominant Sri Lanka Freedom party. There are broader regional issues too. Rajapaksa tilted towards China in his foreign policy, pleasing a section of the business community, but prompting deep concern among others. The former president was banking on his nationalist credentials to propel him back into parliament at the head of a powerful bloc of loyalist MPs. A strong showing would allow him to claim the post of prime minister, held by long-term rival Ranil Wickremesinghe, leader of the United National party. The memory of the 26-year civil war, which ended bloodily in 2009, looms large. When Rajapaksa, wearing his trademark earth brown shawl and holding a gold cylindrical talisman in hand, met supporters at a temple in Kantale before addressing the rally in the town, some wept, telling Rajapaksa how they had lived in fear of their lives during the war. Several described nights spent in jungles, clutching children and hiding in trenches. In campaign speeches, Rajapaksa’s message was simple: renewed civil conflict is inevitable if Wickremesinghe and his coalition partners keep power. “You know what this country was when I took over in 2005, two-thirds of the coastline were not under the control of the government. I am happy that I was able to give back the chance to the people of the north and east [of Sri Lanka] to live without fear. “When groups funded by dollars are trying to defeat us, I am humbled to see the working-class people pushing us to victory,” said Rajapaksa, who has frequently charged the US and other foreign powers with stirring up opposition to him. A United Nations investigative report into the atrocities committed by both sides during the final army assault on the strongholds of the Liberation Tigers of Tamil Eelam (LTTE) will be published this year. 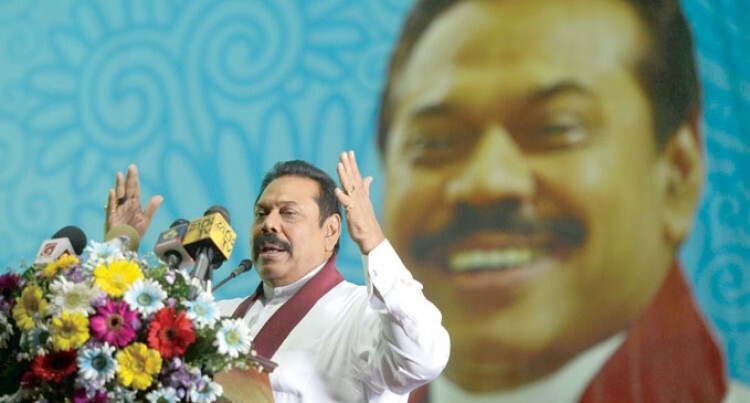 Yet, compared with the intensity of the battle for the presidency in January, this campaign was low key and insiders from the Rajapaksa camp admit that, despite the public bravado, the former president is not on his best form. Some aides blame the effort he and his supporters made to overcome stiff resistance from President Sirisena just to get onto the ballot paper. Sirisena finally gave way, but has said he would not chose Rajapaksa as prime minister whatever the result of the elections. The split within the Sri Lankan Freedom party has also had a big effect. One recent survey found Wickremesinghe heading the polls nationally by almost 10% with limited support for Rajapaksa among minorities. “[Tamils] feel that they [Sirisena and Wickremesinghe] are more amenable to minority issues,” said Abraham Sumanthiran, a Tamil former parliamentarian. Selliah Bavanandan, who once fought with the violent Tamil separatists against Sri Lankan forces, said Tamils could not trust Rajapaksa.